The certification of a file consists in saving on a secure server a digital signature of this file but not the file itself. Any file of any type has a unique digital signature but from this signature it is impossible to reconstruct the file. This digital signature is then associated with a readable signature created by the signatory of the file. This signature is time stamped by the server and not by the signatory. It has a unique and non-modifiable identifier of the signer on the server. In order to be able to provide proof of the ownership of the file, the signatory may include in his signature the digital signature of a private and unique signature file that he is the only one to possess (private key). The signature is then saved on the server. The same file can not be signed twice by the same person or not. To ensure that the file conforms to the least byte to the original which is important in the case of a file offered for download, transmitted as an attachment, available on a network, hosted in a cloud etc ... for protect yourself from simple problems of incomplete download, transmission error etc. or intentional corruption of a file for the purpose of installing a malware, spyware, ransomware, virus or takeover of a computer. Access the digital signature of a file and verify its integrity. 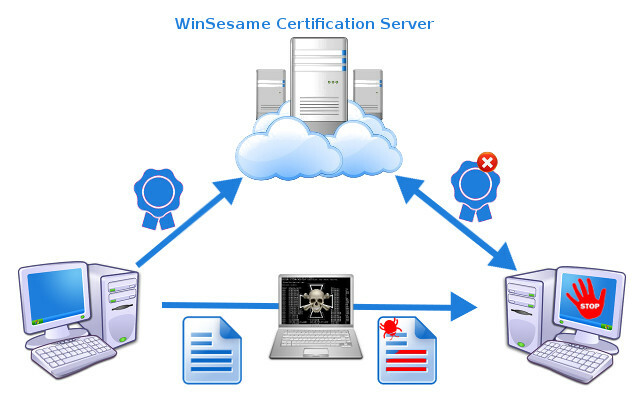 You have received as an attachment or downloaded a signed WinSesame Certification file.This page allows you to view his signature and verify its integrity.The display of the signature of a certified file attests that it has not been modified since it was signed.Otherwise it means that this file is corrupted. It may have been modified to falsify the original content or include malicious code. The file may also be incomplete due to a download problem. Do not open this file. Depending on the case, contact the signer to obtain a compliant file or restart the download. Any file type can be certified WinSesame Certification even executable files for which integrity checking is especially important for protection against virus. Verifying the integrity of a file: This file has not been modified since it was signed. It is certified and the signature is displayed. WinSesame Certification Alert: This file has been corrupted before or during transmission. You must not use this file. Encrypt your files and folders using the most powerful WNS1040 algorithm currently available (+5 other agorithms). 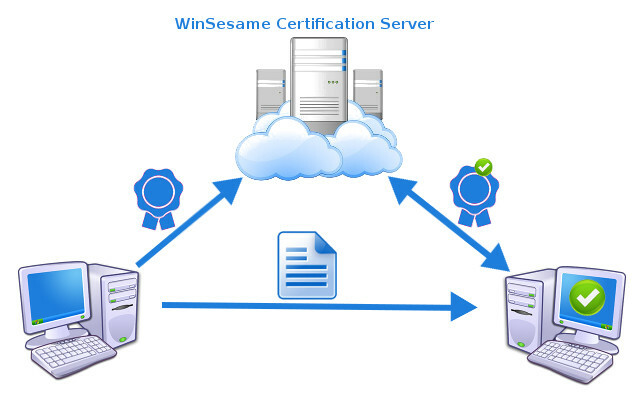 Sign your documents using WinSesame Certification (Classic or Pro version). WinSesame Certification: Free application that allows the verification of file signatures without size limit and the signing of documents using your WinSesame Certification Plus account. The WinSesame Certifcation application is included in all versions of WinSesame (version 11.1 or +). Encryption of files or complete folders by password. Double encryption of files and folders by password plus signature file. Export encrypted files and folders to self-extracting archives. Hiding encrypted files or folders behind photos ..
Verification of WinSesame signatures Certifications without limit of file sizes. Free signature storage space on the WinSesame Certification Server. Hosting space WinSesame Plus Certification for 1000 signatures.